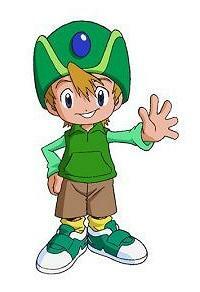 Terriermon is the Digimon partner of Willis, a DigiDestined boy from Colorado, America. Terriermon is the Digivolved form of Gummymon, the In-Training Digimon who Digivolved from the Baby that hatched out of the Digi-Egg that emerged from Williss computer at the same time as the Highton View Terrace incident. Gummymon naturally Digivolved into Terriermon at some point after the defeat of Diaboromon, after his brother Kokomon was taken away and mutated by the Diaboromon virus. Four years after the Diaboromon battle, Terriermon and Willis were attacked by Endigomon  Kokomons Champion form  in New York. The battle drew the attention of T.K. and Kari of the Japanese DigiDestined, and they watched as Kokomon told Willis to go back before disappearing. Willis interpreted this to mean that he was to return to Colorado, so he and Terriermon set off on their way there, much to Terriermons displeasure. Hitching a ride in a truck along the way, they encountered Davis, Yolei and Cody, and Terriermon quickly became friendly with their Digimon. After getting off the truck, Davis, Willis, Terriermon and Veemon were left at the roadside by accident when Kokomon appeared again. Veemon became Flamedramon and battled him, and Terriermon Digivolved into Gargomon for the first time to see him off. He reverted back into Terriermon, and tried to convince Willis to tell Davis and the others the truth about Kokomon, but Willis refused. After they arrived at Williss familys Colorado home, Willis and Davis went out into the woods, and Terriermon overheard the conversation they had, where Willis told Davis about Kokomons origins. Terriermon insisted that he be allowed to fight alongside Willis against Kokomon, and Willis relented, thanking Terriermon for his friendship. The following day, Kokomon appeared again, and promptly Digivolved into his Ultimate form of Antylamon. Terriermon became Gargomon again, and he and the Armour Digimon battled Antylamon, who sank beneath a river at the battles conclusion  only to emerge in his Mega form of Kerpymon. As Kerpymon, Kokomon reverted all the Digimon back into Rookies. Terriermon attempted to battle him, but even with help from the other Rookies, it was in vain. Kokomon scooped them up, and prepared to eat them, but they were saved by the arrival of Angemon and Angewomon, along with T.K. and Kari. Kokomon used his powers to reverse time, transforming all the kids back into toddlers, and Angemon and Angewomon had to act quickly, drawing on all their energy to Digivolve to their own Mega stages of Seraphimon and Magnadramon. Before being cut down and reverted by Kokomon, they released the Golden Digi-Eggs, which Davis and Willis were able to use  with the Digi-Egg of Destiny, Terriermon became Rapidmon, and he and Magnamon destroyed the virus within Kokomon, who reverted to his Vaccine form, and then deleted. As Willis lamented the believed loss of both his Digimon, Terriermon and Veemon floated down from the sky, as Terriermon reassured Willis that he would never lose him. After everyone was restored to normal, the Japanese DigiDestined went back to New York with Willis. A little later, Terriermon caught the scent of a Digi-Egg nearby, which proved to be Kokomon, reborn. Terriermon appears in Digimon: The Movie. His voice is supplied by Mona Marshall. Name: From terrier, a breed of dog. Its curious, but neither the Japanese nor the American creative teams (particularly the latter, though) seem to be able to decide if Terriermon is a dog or a rabbit. Terriermon and Gargomon are named after dogs, and MegaGargomon, his Mega form as shown in the Digimon Tamers series, is both named after a dog and has a clearly canine face (and his Japanese name is "SaintGalgomon," with the "Saint" coming from "Saint Bernard," another breed of dog). However, Rapidmon is clearly a rabbit-design, and Terriermon US attack is Bunny Blast  and the Digivolutionary line of Lopmon, Terriermons twin (and Kokomons Rookie) is clearly rabbit-influenced, with Antylamon identified as the rabbit Deva in the season three. 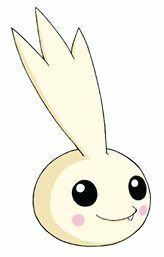 Also, in the card game, one of his Champion forms Tureimon, is named after the Chinese festival of rabbits. 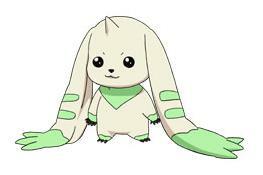 Likewise in the American version of the Tamers series, there are numerous references to Terriermon and Gargomon having rabbit-like attributes. The first Thundermon the kids encountered was not actually a real Digimon, but was actually an unliving construct, created from a Control Spire by Arukenimon. 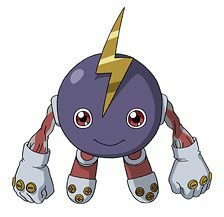 This Thundermon attacked Cody and Digmon in an underground tunnel as the DigiDestined worked to repair a Punimon village  Digmon was no match for the miniscule Digimons speed and electric powers, and reverted to Armadillomon before Thundermon brought the tunnel crashing down. This, however, caused Armadillomon to Digivolve to Ankylomon for the first time, and he burst out of the tunnel, keeping Cody safe. Cody, however, was then swept up by a gale created by Thundermon, but was saved by Stingmon, who then wasted no time in destroying the Thundermon with his Spiking Strike. The DigiDestined, especially Yolei, were horrified, and thought Ken and his Digimon hadnt changed at all, until they learned the truth later on. Two Thundermon were later seen during the final battle with MaloMyotismon. Takeru Takaishi, nicknamed T.K. by his brother and friends, is a member of the DigiDestined, partnered with Patamon and holder of the Crest of Hope. As the youngest of the initial seven kids, and the younger brother of Matt, T.K. is a bit of a cry-baby, but can hold his own when he has to. Matt and T.K. 's parents are divorced, and T.K. lives with their mother, Nancy Takaishi, outside of Odaiba, where Matt lives with their father. As such, he does not see as much of Matt, whom he loves very much, as he would like. He and Kari are very close. Four years before the summer of 1999, before their parents were divorced, Matt and T.K. lived in Highton View Terrace, where, one fateful night, they witnessed the battle between Greymon and Parrotmon, marking them among the chosen who would be the next generation of DigiDestined. T.K. tried to tell his mother about the monsters, but she didn't believe him, and in time, he and Matt both repressed the memory, and other concerns took over, as their parents divorced, and the brothers were split up. Then, in August 1999, as the worlds weather systems went haywire around them, seven of the eight kids who had witnessed that battle four years before recieved their Digivices, and were taken to the DigiWorld. Upon arriving, T.K. formed an instant bond with Tokomon, his In-Training Digimon, their childlike natures meshing well with each other. Matt and T.K., considering they don't see a lot of each other, were having a little trouble relating, and Matt found it difficult to be a good brother, or even to really admit that he cared. However, when T.K. was under threat from Seadramon, Matt came to his rescue, but in turn, had to be saved from Seadramon by Gabumon. This act showed Matt the importance of being a good brother, and he began to make looking after T.K. his primary responsibility. T.K. 's Rookie-level Digimon, Patamon, seemed to be incapable of Digivolving at first. When the kids were split up by Devimon, and sent to different chunks of the shattered File Island, T.K. and Patamon found themselves at Primary Village, where new Baby Digimon hatch from Digi-Eggs. Patamon explained to T.K. about Baby Digimon, and T.K. recalled a memory about when he was very young, but the happy atmosphere was disturbed by Elecmon, the village's guardian, who saw T.K. and Patamon as invaders. He and Patamon fought, until T.K. made them stop, and suggested they have a tug-o-war instead. Patamon won, and Elecmon realised they weren't such bad guys, letting them stay at the village. However, Devimon had dispatched Leomon, under the influence of a Black Gear, to destroy T.K. and Patamon, knowing that it had been foretold that the smallest would destroy him. Fortunately, the other kids arrived in time to use their Digivices to drive the Black Gears out of the Leomon. The kids then scaled Infinity Mountain, and battled Devimon, who had absorbed the Black Gears into his body and grown to an enormous height. Things look bleak, as Devimon grabbed Patamon in his hand, preparing to crush him, when, miraculously, the little Digimon finally Digivolved into his Champion stage of Angemon! Drawing on energy from the other kids' Digivices, Angemon used up all of his energy to destroy Devimon, sacrificing himself in the process. A Digi-Egg formed from Angemon's remains, which T.K. then carried with him, until it hatched into Poyomon just before the kids were ready to depart for Server. When the kids arrived on Server, Poyomon Digivolved into Tokomon, and the kids ran afoul of Etemon, multiple times. After the kids received an e-mail from Datamon, who requested that they free him from Etemon's pyramid, T.K. found his Crest, the Crest of Hope, within the pyramid. After the final battle with Etemon, during which Tai was sucked through a temporal warp back to Earth, the DigiDestined began to break up without his leadership, and soon, only Matt, T.K. and their Digimon were left together. Arriving at a lakeside amusement park, Matt left T.K., saying he was just going to go out across the lake, and would be back in a few hours. However, Matt did not return, and, several weeks, or possibly even months later, T.K. ran into DemiDevimon. DemiDevimon said that Matt was not coming back through choice, but Tokomon called him a liar. T.K. was angry with Tokomon, and threw down his Crest and Digivice, leaving with DemiDevimon. Thankfully, Tai soon returned, and was able to help T.K. escape DemiDevimon's clutches, with Tokomon Digivolving to Patamon to see him off. He and T.K. then travelled out across the lake, where they found Matt and Joe imprisoned in the diner of Digitamamon. WereGarurumon defeated Digitamamon, and then Matt and T.K. found Izzy in the mountains. They soon met up with Tai and Joe again, who had found Mimi, and then came across Sora, who had been hiding, helping out the other kids in their tasks, to try and make her Crest of Love glow. T.K. told Sora that he didn't want her to stay away from them, because he liked her - she reminded him of his mother (it's very possible - and indeed, likely - that T.K. had something of a "little boy crush" on Sora). Sora assured T.K. she wasn't going anywhere, and then, the group was attacked by DemiDevimon's boss, Myotismon. When the kids returned to Earth to stop Myotismon's plans to find and destroy the Eighth Child, the predestined eighth member of the DigiDestined, all the kids went to Highton View Terrace, realising that it was the common denominator, as they had all lived there at the same time at one point. T.K. was the first to remember the battle they had seen four years before, and one by one, the supressed memory began to return to the surface in the kids' minds. Later, Matt took Tai on the subway, intending to take him to their mother's home. However, before they got there, Patamon and T.K. got into an argument, and Patamon left in anger. T.K., Matt and Gabumon followed, and they all ran into Gotsumon and Pumpkinmon, minions of Myotismon. However, they just wanted to have fun, rather than look for the Eighth Child, and when Myotismon showed up to destroy the kids, the two brave Digimon fought him, but were destroyed. In anguish, T.K. 's Digivice glowed, and Patamon Digivolved to Angemon for the second time to join WereGarurumon in beating Myotismon back. Matt then took T.K. back to their mother's. As their mother's apartment was not in central Odaiba, T.K. was not among those captured and brought before Myotismon when the city was sealed off by the villain's fog-bank. However, when he learned of the threat posed to the city, he all but demanded that his mother take him to the train station so that the could go into the city and help out. However, when they arrived at the station, they found that the trains weren't running. T.K. bumped into Joe, and the two of them voyaged across the bay on Ikkakumon's back, much to T.K. 's mother's shock. As they neared the city, they were attacked by MegaSeadramon, but Ikkakumon Digivolved into Zudomon to defeat him. They then found Wizardmon floating in the bay, where he had been thrown by Myotismon previously. Wizardmon had the Eighth Child's Crest - and told Joe and T.K. that that child was Tai's little sister, Kari! Joe and T.K. brought Wizardmon into Odaiba, and met up with the other kids at Myotismon's base, the Odaiba TV station. Angemon leant a hand in the battle, when Kari's Digimon, Gatomon, Digivolved into Angewomon to destroy him. When Myotismon returned as VenomMyotismon, T.K. had to have Angemon shoot an arrow of Hope at Matt (as did Kari have to have Angewomon shoot one of Light at Tai), to enable Gabumon (and Agumon) to Warp-Digivolve into their Mega stages, so they could defeat the tyrant. T.K. went back to the DigiWorld with the other to help battle the Dark Masters. When they were fighting Puppetmon, T.K. was captured by the villain, and forced to play a deadly game of hide and seek. T.K. outwitted him by saying he had no friends, distracting him long enough to destroy the apparatus he was using to manipulate the DigiDestined. Matt grew depressed, as he realised T.K. could take care of himself now, and thought that he was no longer needed as part of the group. Cherrymon converted his depression into anger, forcing him into a fight with Tai. When the battle ended, Matt left the group, instructing T.K. to stay with Tai. T.K. then led the remaining kids (Mimi and Joe had left also) back to Puppetmon's mansion, where they began battling with him. Matt and MetalGarurumon returned briefly to destroy Puppetmon. On the way to Machinedramon's city, Kari fell ill, and the kids hid in a large house in the city. Tai charged T.K. with looking after Kari and Sora while he and Izzy looked for medicine. Thanks to T.K., Sora, Kari and their Digimon were out of the house when it was bombed by Megadramon. When Machinedramon himself sent the kids tumbling into the sewers, T.K. 's concern for Kari came to the forefront as they and Sora searched for Tai and Izzy. Energised by a bizarre light from Kari, WarGreymon destroyed Machinedramon. T.K. and Kari built a monument to the Numemon who had sacrificed themselves in helping to defeat the villain, and then, they were attacked by Piedmon's bodyguard, LadyDevimon. During the fight, Tai sent T.K. and Sora to look for Matt, Joe and Mimi. They accomplished the task, and returned to fight Piedmon, but the villain's magics turned everyone but Kari, T.K. and Patamon into key chains. Attempting to climb a rope to safety, T.K. was grabbed by Piedmon, and Kari grabbed him, holding on tight. T.K. told her to let go, but she refused, and Piedmon simply hacked the rope in two. As the two children fell, T.K. 's Crest finally began to glow, and, at long last, Angemon Digivolved into MagnaAngemon. He saved T.K. and Kari, and used his MagnaAntidote to return everyone to normal. His Gate of Destiny attack then sucked in Piedmon's Vilemon horde, and then Piedmon himself. After the kids defeated Apocalymon, and had to say goodbye to their Digimon as the DigiWorld was being reformatted to normalcy, both T.K. and Kari had a feeling they would see their Digimon again. Eight months later, T.K. was an observer in the battle on the Internet, as Diaboromon launched nuclear missiles at Japan in hopes of exterminating the DigiDestined. T.K., who was with Matt at their grandmother's, watched as Matt went into the Internet along with Tai, and WarGreymon and MetalGarurumon fused into Omnimon, to destroy the villain and stop the launch. In May 2000, T.K. and the other kids were called back into the DigiWorld by Gennai, and instructed to give up the power of their Crests, creating a seal that would protect the DigiWorld from the forces of evil. However, as a side effect of this, Patamon and the other Digimon lost their ability to Digivolve to Ultimate. Later, T.K. and his mother moved into a new apartment building inside of Odaiba. Four years later, on his first day at his new school, T.K. met Yolei and Cody, and walked with them to school, where he met Davis, and learned that he was now in the same class as him and Kari. Davis immediately became jealous of T.K.s friendship with Kari  who he had a crush on  thinking he was trying to move in on her. Later that day, as Davis tried to confront T.K., Yolei brought an e-mail for Kari that she had received from Tai, that informed them the DigiWorld was in trouble. Kari and T.K. met up with Izzy, and prepared to head into the DigiWorld, when three new Digivices emerged from the computer in front of them  they had come from the Digi-Egg of Courage, which had been found by Tai. One of the Digivices went to Davis, who then went with Kari and T.K. into the DigiWorld. T.K. was reunited with Patamon, and Davis was able to lift the Digi-Egg of Courage, releasing his partner, Veemon. Veemon then became Flamedramon to defend them from a Monochromon under the control of the Digimon Emperor. T.K. returned to the DigiWorld the next day, along with Kari, Davis, Sora, Izzy, Yolei and Cody. Davis and Veemon were captured by the Emperor, but Yolei and Cody found their Digi-Eggs and Digimon, and saved him. When the kids were attacked by a herd of Tyrannomon in the Emperors thrall, T.K. and Kari fled the battlefield, coming across a cave, inside of which they found the Digi-Eggs of Hope and Light. Using them, Patamon and Gatomon became Pegasusmon and Nefertimon, who defeated and freed the Tyrannomon. T.K. participated in the missions to destroy the Control Spires in Santa Caria and in the frozen north of the DigiWorld, and then when Kari was trapped in the city of the Gardromon, he and Davis went to her rescue  arguing all the way. Without a Spire nearby, T.K. was able to have Patamon Digivolve to Angemon again to gain them access to the city, but he reverted right back to Patamon after entering. Pegasusmon and Flamedramon battled the Gardromon, and then Kari helped Andromon free himself from the influence of the Dark Ring controlling him. T.K. and Davis clashed a few more times, particularly during the attempts to rescue MetalGreymon from the clutches of the Emperor. A little while after this, when Kari began to suffer from recurring nightmares, he started to fear for her safety  and it was justified, as Kari found herself drawn into the enigmatic, other-dimensional World of Darkness. T.K. searched for her in earnest, unaware of the fact she was in another dimension, but then, somehow, Kari reached out across the worlds, and opened a gate, though which T.K., Patamon and Gatomon leapt. Patamon then became Pegasusmon and destroyed the Control Spire in the Dark Ocean, and somehow, Gatomon was able to Digivolve into Angewomon to save Kari from an Airdramon and to free the Scubamon that had drawn her there in the first place. However, the Scubamon proved to be more than meets the eye, as they changed shape, and tried to force Kari to come into their underwater kingdom. Angewomon fended them off, and Kari and T.K. returned home. Later, during the summer, T.K. and Kari got together with the other original DigiDestined, and they all told the new kids the story of their first adventure, in celebration of the anniversary of their first trip to the DigiWorld. When the DigiDestined discovered the location of the Digimon Emperors base, T.K., Pegasusmon and Tentomon followed Cody and Submarimon inside, as the base itself reached the Dark Whirlpool. While they worked on freeing the Emperors captives, T.K. was horrified to see that the source behind the Dark Whirlpool was none other than Devimon! Enraged by the Emperors audacity in attempting to control of the powers of darkness, T.K. stormed off in search of him, followed by Patamon. He soon came across the Emperor, and warned him that he didnt know what he was getting involved with. The Emperor refused to listen, and lashed out with his whip, striking T.K., but it did not phase the boy. T.K. studied his wound  and then leapt at the Emperor, fists flying, knocking him to the ground with a single blow to the face. As the fist fight continued, the Emperors creation, Kimeramon, battled the other kids and their Digimon. T.K. abandoned his fight, and he and Pegasusmon saved them. Later, the Emperor took Kimeramon and his fortress on a rampage across the DigiWorld, razing cities and setting up Control Spires in his wake. The DigiDestined managed to get on board, but were defeated by Kimeramon once again. Wormmon helped Davis locate the Digi-Egg of Miracles  the fortresss power source  which Davis used to transform Veemon into Magnamon. As Magnamon and Kimeramon battled, T.K. and the other attempted to convince the Emperor to come with them, trying to explain that Digimon were living creatures and not just data. After Magnamon destroyed Kimeramon, the Emperor ranted that he would reset the digital world, and the DigiDestined were finally able to convince him of his wrongs. He reverted to his true persona of Ken Ichijouji. Later, when Davis suggested that they allow Ken to join the group, T.K. was the only one who agreed with the idea, and observed an evening meeting between Davis and Ken. T.K. participated in the battled against Arukenimon and her unliving minions, helping Yolei and Kari use the computer in the Giga House to free the Digimon from Arukenimons mind control. When Arukenimon and her partner, Mummymon, combined one hundred Control Spires to form BlackWarGreymon, T.K., Pegasusmon, Kari and Nefertimon were the first to fall before the newborn villains might. After BlackWarGreymon revolted against Arukenimons control and destroyed the first Destiny Stone, T.K.s anger began to grow again, as he viewed BlackWarGreymon as another artificial creature of evil, like Kimeramon, and Devimon before him  who had nearly caused him to lose Patamon four years before. His anger continued to rise, erupting every so often in fits of fury, as BlackWarGreymon continued to destroy the other Destiny Stones. During the battle for the fourth stone, Angemon was exposed to the stones energy, giving him the power to Digivolve into MagnaAngemon again. T.K. instructed MagnaAngemon to destroy BlackWarGreymon, but he failed, as BlackWarGreymon destroyed the Destiny Stone, cutting off MagnaAngemons power and causing him to revert to Patamon. 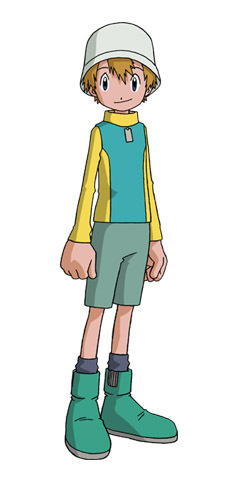 Cody, who had not been understand of T.K.s anger, could now see why he felt the way he did, and with that understanding, the two boys were finally able to have their Digimon DNA Digivolve  in the battle to protect the final Destiny Stone, Angemon and Ankylomon merged into Shakkoumon and joined in the fight against BlackWarGreymon. The battle was ended when T.K. and the others attempted to moved the Destiny Stone with their Digivices, which freed Azulongmon from the prison the Dark Masters had sealed him in years before. Azulongmon dealt with BlackWarGreymon, then warned the DigiDestined of a greater enemy. When Christmas came, T.K. and the others were all too happy to go to Kens Christmas party, but the holiday revelry was interrupted by the arrival of a Control Spire and some wild Digimon, brought through a Digi-Port by Arukenimon. The Armour Digimon destroyed the Spire, and then the original DigiDestined and the new kids teamed up together to send the wild Digimon back into the DigiWorld. However, Izzy discovered that the same scene was repeating all over the Earth, as wild Digimon and spires were appearing all across the globe. The original eight Digimon had their power to Digivolve to Ultimate restored by a power boost from one of Azulongmons Digi-Cores, courtesy of Gennai, and then they and the kids were then taken all over the world by Imperialdramon to destroy the spires and round up the wild Digimon. T.K., Tai and their Digimon were taken to France, where they met with T.K.s grandfather, and confronted Mamemon, BigMamemon and MetalMamemon at the Palace of Versailles. The Mamemons had taken Catherine, a French DigiDestined girl, hostage, and T.K. and Tai  both quite taken with her  freed her and her Floramon as Angemon and Greymon battled the misfits. Then, their boss, Giromon, appeared, and Angemon and Greymon Digivolved into MagnaAngemon and MetalGreymon to defeat them, along with a little help from Kiwimon, Floramons Champion form. Returning to Tokyo, there was no time to rest, as the Daemon Corps appeared in the city the next day, in search of Ken and the Dark Spore within him. T.K., Cody, Angemon and Submarimon tackled MarineDevimon and saved a cruise ship, before joining in the battle against SkullSatamon. However, the villain quickly defeated all opposition, and the original eight Digimon sacrificed their power to Digivolve to Ultimate once again, using the energy to power up Imperialdramon, who Mode Changed to his Fighter Mode and destroyed SkullSatamon. Then, Arukenimon arrived, and convinced Ken to come with her, using a truckload of kidnapped children as leverage. As Davis, Wormmon and Raidramon pursued the truck, T.K., Cody and Jim Kido helped to evacuate a hospital as Shakkoumon battled MarineDevimon, eventually being forced to destroy him to save Cody. Everyone then converged on Highton View Terrace, where Arukenimons boss, Oikawa, was prepared to hand Ken over to Daemon, having already duplicated the Dark Spore and implanted it in the kidnapped kids. Daemon was single-handedly able to match the power of the kids three DNA Digivolved Digimon, as T.K. and Kari realised that the World of Darkness could contain Daemons power. Ken used the remnants of dark power within him to open a gateway into the Dark Ocean. T.K. and Kari gave him their support and strength, and were soon joined by Yolei, Cody and Davis, opening the gate wide, and sending Daemon through. The DigiDestined then had to keep watch over the kids Oikawa had implanted with Dark Spores, as they grew within them. T.K.s mother was able to track down the names and addresses of the kids, and T.K. and Cody trailed Noriko, who shocked them by kicking a cat from her path. Soon, Norikos spore flowered prematurely, and Oikawa absorbed its power, fatally injuring the returned BlackWarGreymon, who used the last of his strength to seal the Highton View Terrace gate. T.K. and the other DigiDestined (sans Tai and Sora) then watched over Highton View Terrace, awaiting the return of Oikawa and the Spore kids. Oikawa then opened a portal to what he thought was the DigiWorld, but when T.K. and the others followed him, the kids and Arukenimon and Mummymon through, they found that it led to a completely different dimension, where the truth finally came out  Oikawa was possessed by the spirit of Myotismon, who had been manipulating his actions for the last four years. Myotismon exited Oikawas body and used the power of the Dark Spore to transform himself into MaloMyotismon. After destroying Arukenimon and Mummymon, he turned his attention to the DigiDestined, who were terrified  too scared to even fight. Davis and ExVeemon went up against MaloMyotismon, as the other began to overcome their fears and hide them from MaloMyotismons mind-reading powers. The tactic didnt work, however  MaloMyotismon then subjected the kids to illusions of their greatest desires instead. T.K. saw his family back together again, and sat and ate dinner with them, but Patamon and Davis managed to pull him out of it. Then they and the others helped freed Ken from his illusion, and they all used the power of the dimension to their own ends, making their Digimon Digivolve into all their separate forms at once. Patamon, Angemon, MagnaAngemon, Pegasusmon and Shakkoumon joined with all the other Digimon in attacking the villain, who then fled into the DigiWorld and absorbed the darkness there, boosting his powers and initiating his plan to shroud both Earth and the DigiWorld in pure darkness forever, under his rule. As the DigiDestined from all across the world gathered with their Digimon, T.K. and the others convinced the Spore kids to realise their dreams were not meaningless, as they had been lead to believe. This positive energy destroyed MaloMyotismons body, and then everyone used their Digivices to power up Imperialdramon, who used his Giga Crusher attack to destroy Myotismons spirit, hopefully for good. Three months later, when it was discovered that Diaboromon had survived his battle with Omnimon, Tai, Matt and Omnimon returned to the Internet to battle the villain, while T.K. and the other younger kids set about rounding up the Kuramon that had begun to appear in the real world. T.K. and Cody found one at a soccer game, and then T.K., Kari and their Digimon ventured into the 'net to help Omnimon out. With their help, Diaboromon was destroyed, but the Kuramon escaped to the real world, where they merged into Armageddemon. T.K. and Kari returned to the real world, to Izzy's apartment, while Imperialdramon Paladin Mode destroyed Armageddemon. Twenty-five years into the future, the portal to the DigiWorld remains open, and Patamon is still at T.K.s side. T.K. has married, and has a son, who has a Tokomon for a partner. In the aftermath of MaloMyotismon's defeat, Digimon could no longer be kept secret from the world, and so T.K. began to write a book to help people learn and understand them. In his adulthood, he has become a novelist, working on a series of books about the adventures of the DigiDestined. Chronologically speaking, T.K. first appears in "Digimon: The Movie. He first appears in the series in And so it begins..." In season one, his voice is supplied by Wendee Lee, while in season two, he is performed by Doug Erholtz. 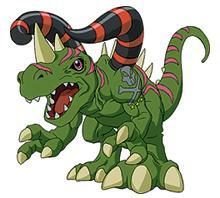 Togemon is the Digivolved form of Palmon, the Digimon partner of Mimi of the DigiDestined. Togemon first appeared to protect Mimi from the Black Gear-infected Monzaemon. Monzaemon had captured the other kids and brought them to Toy Town, where they were brainwashed. After a little help against Monzaemon from some Numemon they had encountered previously, Palmon was able to Digivolve into Togemon, and used her Needle Spray attack to force the gear out of Monzaemon. Togemon next appeared after the kids had been split up by Devimon, and helped Kabuterimon to battle Centarumon, who was also infected with a Black Gear. She then participated in the final battle with Devimon. When the kids arrived on Server, Togemon appeared to battle Kokatorimon with Birdramon, using her Light Speed Jabbing attack to finish him off. She then appeared again to help some of the other Champion Digimon distract Etemon, while Tai, Izzy, Sora and T.K. went inside his pyramid to rescue Datamon. They repeated the stunt when Datamon double-crossed them, and they had to rescue Sora from his clutches. Togemon next appeared to help Greymon and Ikkakumon battle ShogunGekomon, after Mimi sang to wake him up, at the behest of the Gekomon and Otamamon. She then helped the other Champions battle Myotismon when he first attacked the kids, and to fight his forces to allow the kids to access the villain's portal-gateway to Earth. Myotismon and his armies had invaded Odaiba, and, soon after the DigiDestined's return to Earth, captured the majority of the city's populous, corralling them in the convention centre. Mimi and Sora were among those captured, and when Sora engineered an escape plan, Togemon appeared to battle DarkTyrannomon. In the course of the battle, Mimi's Crest, the Crest of Sincerity, finally began to glow, and Togemon Digivolved into her Ultimate form of Lillymon. Lillymon defeated DarkTyrannomon, but was paralysed by Myotismon. Wizardmon healed her, and she participated in the final battle with Myotismon. Togemon also leant a hand in the fight with VenomMyotismon. When the kids returned to the DigiWorld, Togemon appeared to fight MetalSeadramon, then Digivolved to Lillymon to fight Machinedramon, but was blasted back to Tanemon by Puppetmon. After the kids escaped this initial battle with the Dark Masters, Togemon appeared to fight Scorpiomon, Digivolving to Lillymon to help Zudomon beat him. She again Digivolved into Lillymon to protect Mimi from the Garbagemon. After that, Mimi decided that she no longer wished to fight, and left the team. Palmon, along with Joe and Gomamon, went with her, but even when they came under threat from MetalEtemon, Mimi wouldn't let Palmon Digivolve in case she got hurt. As such, it was not until the final battle with Piedmon and the battles with Apocalymon that she was allowed to Digivolve again, becoming Lillymon to help defeat the villains. In May 2000, Palmon and the other Digimon lost the ability to Digivolve to Ultimate when Mimi and the others gave up the power of their Crests to seal the DigiWorld off from evil. Four years later, Palmon and Mimi were reunited when Mimi came to the DigiWorld on a picnic with the newer, younger DigiDestined kids. They, along with Yolei and Hawkmon, were attacked by the Roachmon Brothers, two servants of the Digimon Emperor, but Palmon was unable to Digivolve because of the Control Spire in the area. They managed to get the Roachmon to fly into the spire, damaging, and enabling Palmon to become Togemon again. She and Halsemon used their attacked to blow up the spire and free the Roachmon from their Dark Rings. Togemon then resolved to protect the area from the Emperor in the future. Togemon appeared again a little while later, when Mimi introduced the new DigiDestined to Michael, another DigiDestined boy from America. While Michael and the other talked in Digitamamons diner, they found themselves under attack from Gorillamon. Michaels Betamon Digivolved into Seadramon, and took the battle underwater, hurling Gorillamon out with his Ice Blast attack. Palmon Digivolved into Togemon and used her Light Speed Jabbing technique to shatter the Dark Spiral on Gorillamon, freeing him. 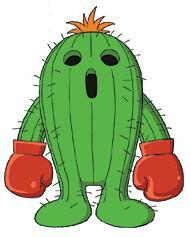 Togemons only other appearance was when wild Digimon were appearing all over Earth. Palmon power to Digivolve to Ultimate was restored by an energy boost from one of Azulongmons Digi-Cores, courtesy of Benjamin, Gennais American counterpart, and Palmon quickly Digivolved into Togemon, before Digivolving straight on to Lillymon, and going to Rockafeller Centre with the others to stop a wild Cherrymon there. Togemon first appears in "Togemon in Toy Town." Her voice is supplied by Mari Devon. Name: From the Japanese word, "toge," meaning needle or thorn. After running into a gang of Numemon, the kids are brainwashed by the Black Gear-infected Monzaemon, who imprisons them in his Toy Town, but is defeated when Palmon Digivolves to Togemon for the first time. 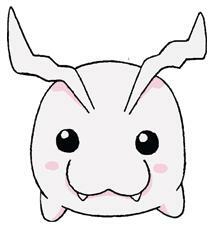 Tokomon is the In-Training form of Patamon, the Digimon partner of T.K. of the DigiDestined. T.K. met Tokomon almost immediately upon his arrival in the DigiWorld with the other kids, and formed a strong bond with him very quickly. When Kuwagamon threatened the kids, Tokomon Digivolved into his Rookie form of Patamon, along with the other Digimon, to beat him back. When Patamon's Champion form of Angemon defeated Devimon, he had to sacrifice himself in the process. A Digi-Egg formed from Angemon's remains, which T.K. carried with him, until it hatched in Poyomon just before the kids left File Island for Server. When they arrived on Server, they found a village of Pagumon, and Poyomon Digivolved back into Tokomon. Tokomon discovered that the Pagumon had actually stolen the village from a group of Koromon, who they had imprisoned, but the Pagumon subdued him with they learned that he had discovered this. The Pagumon's associates, the Gazimon, called their boss, Etemon, in, and he attacked the kids, sending them fleeing across the desert. After the final battle with Etemon, during which Tai was sucked through a spatial warp back to Earth, the group began to fall apart without his leadership. Soon, only T.K., Tokomon, Matt and Gabumon were left. Matt left T.K. at a lakeside funfair, saying he'd be back in a few hours, but he failed to return, as he was roped into helping Joe pay off a check by washing dishes at Digitamamon's restaurant. Due to the machinations of the evil DemiDevimon, Matt was stuck there for a long time, so DemiDevimon was free to work his evil on T.K. DemiDevimon convinced T.K. that Matt wasn't returning out of choice, but Tokomon didn't believe him. Enraged, he used his Bubble Blow attack on DemiDevimon, and T.K. was angry with him for doing so. Tokomon, knowing he was right, refused to apologise, and T.K. threw down his Digivice and Crest, leaving with DemiDevimon. Soon, Tai and Agumon returned, and found Tokomon, who filled them in on what had happened. DemiDevimon tried to convince Tai that he was a nice guy, and almost tricked them into eating Mushrooms of Forgetfulness - but when they found out what he was doing, Tokomon Digivolved into Patamon, and used his Boom Bubble attack to send DemiDevimon sailing off over the horizon. After using up all his energy in the final battle against VenomMyotismon, Angemon De-Digivolved into Tokomon, then back to Patamon upon returning to the DigiWorld to battle the Dark Masters. Four years later, after Angemon and Ankylomon DNA Digivolved into Shakkoumon, Tokomon reappeared when he De-Digivolved. The same thing happened again after the battle at Christmas. Twenty-five years into the future, T.K.s son has a Tokomon for a partner. Tokomon first appears in "And so it begins..." His voice is supplied by Laura Summer (at least in the first episode, anyway, but it seems to change every time the little guy appears). Name: From the Japanese word, "tokoton," meaning the very last. The first Tortomon encountered by the kids was not a pleasant one. Daviss various attempts to make Veemon Digivolve to the Champion level resulted in a rockslide, and several of the boulders crashed into Tortomon. Enraged, he chased Davis and Veemon across the DigiWorld, through the various areas that the other kids were rebuilding, until he eventually had them cornered on a cliff top. Davis tried to stall him by asking him to wash his hands before he ate them, but to no avail. Then, finally, Veemon Digivolved into his Champion form of ExVeemon, and defeated Tortomon, hurling him off the cliff. Tortomon laughed, washed his hands, and tromped off. This is one of the few episodes of Digimon that received major plot-altering edits in the US. In the original Japanese version, Davis and Veemon accidentally saw Tortomon urinating, and that was why he was so angry. Davis DID originally ask him to wash his hands, as its just good hygiene. After ExVeemon blasted him of the cliff, Tortomon... er... finished his business, and washed his hands. At Christmas, when wild Digimon were appearing all over Earth, Lou, a Native American DigiDestined boy, was shown to have a Tortomon for a partner. Lou and his Tortomon had rounded up wild Digimon across the country, and brought them to New York to be sent back to the DigiWorld, but first, they had to help out Mimi, Michael and Davis subdue a Cherrymon at Rockafeller Centre. Lous Tortomon used his Strong Carapace attack together with the attacks from various other American DigiDestineds Digimon to knock the Cherrymon out. Lous Tortomon then went back to the DigiWorld with all the others. Lous Tortomon appeared again during the final battle with MaloMyotismon, when the villain was attempting to infect Earth with pure darkness. A Tortomon first appears in Davis Cries Wolfmon. Its voice is supplied by Bob Papenbrook. Lous Tortomon first appears in Digimon World Tour, Pt. 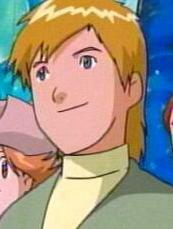 1. Its voice was apparently also Papenbrook, but it doesnt say enough to really tell. Toy Town is, true to it's name, a town full of toys, on File Island, owned by Monzaemon. It's actual function is unknown - it was only seen when Monzaemon was under the thrall of a Black Gear, and had brain-washed the kids into staying there; but the kids didn't get to play with the toys - the toys played with the kids! Monzaemon was freed from the Black Gear by Togemon, and freed the children's minds. Toy Town, like the rest of the DigiWorld, was later reconstituted as Spiral Mountain by the Dark Masters, and returned to normal with Apocalymon's defeat. Toy Town appears in "Togemon in Toy Town." As Matt, having wandered off from the group, is corrupted by Cherrymon, the other kids battle the Garbagemon, minions of Puppetmon. When they are defeated, Matt emerges from the forest, and MetalGarurumon challenges WarGreymon to battle! When wild Digimon began to appear all over Earth, a Triceramon was one of the ones that appeared in Japan  in Tamachi, to be exact, the district where Ken Ichijouji lived. Wormmon was unable to Digivolve to battle the creature, as a result of an active Control Spire in the area, and Davis rushed to his aid with Raidramon, who destroyed the Spire. Raidramon reverted to Veemon and then became ExVeemon, to merge with Stingmon into Paildramon, who immediately began grappling with the Triceramon. When Mummymon joined in the battle, Paildramon was outmatched  but across town, in Izzys apartment, Gennai had appeared, and released the power of one of Azulongmons Digi-Cores. The light from the Digi-Core flew across town, and struck Paildramon, allowing him to Mega Digivolve to Imperialdramon. Imperialdramon easily picked up Triceramon, and hurled him through the Digi-Port on Kens computer. 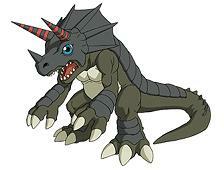 Triceramon appears in Dramon Power. His voice is supplied by Richard Epcar. Name: From Triceratops, a type of dinosaur, which means "three horned face" in Greek. Tsubumon is the Baby form of Armadillomon, the Digimon partner of Cody of the DigiDestined. 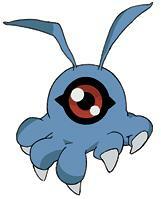 Tsubumon first appeared after Shakkoumon De-Digivolved, following Azulongmons appearance. He Digivolved back into Upamon and then Armadillomon, and into Digmon for the battle at Christmas, when a Control Spire and wild Digimon appeared in Odaiba. After the spire was destroyed, Armadillomon became Ankylomon and DNA Digivolved with Angemon into Shakkoumon to join the battle against the Ultimate Digimon amongst the wild ones. After the battle, he reverted into Tsubumon, and then ate sushi with Cody after going home. After Armadillomon received an influx of Digi-Core power courtesy of Gennai, he only went back to his Rookie form after becoming Shakkoumon. As such, Tsubumon didnt appear again. Tsubumon appears in Kyoto Dragon and A Very Digi Christmas. His voice is supplied by Dave Mallow, but he only ever giggles. Name: From the Japanese word, tsubu, meaning a grain or a drop. Tsubumon is never named in dialogue in the US. In A Very Digi Christmas, he was mistakenly named as Upamon during Karis Christmas story. Tsumemon is the In-Training level of Kuramon, the bizarre half-Digimon, half-virus creature which hatched from the Digi-Egg created by the chosen child from American named Willis. When Izzy and Tai discovered that Kuramon had Digivolved into Tsumemon, the monster sent them an e-mail, which read: "I'm hungry!" Tsumemon began to consume digital matter from the Internet, putting technology as we know it at risk. Hastily, Izzy latched Tai's computer up to Tai's father's, and when they put the two machines on-line again, they discovered Tsumemon had Digivolved into its Rookie stage of Keramon. 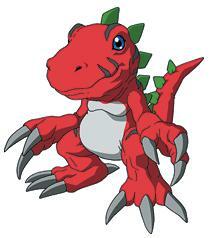 Tsumemon appears in "Digimon: The Movie." He never speaks, and is never referred to by name. Tsunomon is the In-Training form of Gabumon, the Digimon partner of Matt of the DigiDestined. Matt met Tsunomon almost immediately after arriving in the DigiWorld, and they got along okay. When Kuwagamon threatened the kids, Tsunomon Digivolved to his Rookie form of Gabumon, along with the other Digimon, to beat him back. Tsunomon reappeared some time later, after Gabumon's Champion stage of Garurumon Digivolved into WereGarurumon to defeat Digitamamon, reverting back to Tsunomon afterward. He Digivolved back up to Gabumon and then to Garurumon to help the other Champions battle Myotismon, then on to WereGarurumon to battle the guardians of Myotismon's portal to Earth, reverting back to Tsunomon when he and the others arrived on Earth. He Digivolved back into Gabumon when he, Matt and T.K. were searching for Patamon in Odaiba, and they ran into Pumpkinmon and Gotsumon. Gabumon gained a little more control over his Digivolutions at this point, and would only revert back to Rookie after going Ultimate. He Digivolved up to WereGarurumon to help in the final battle with Myotismon, and then reverted to Tsunomon after Warp-Digivolving to MetalGarurumon to help beat VenomMyotismon. Tsunomon went back to the DigiWorld with the others and then Digivolved up to WereGarurumon for the first battle with the Dark Masters, but was blasted back to Gabumon by Puppetmon. He then Digivolved to MetalGarurumon to fight Piedmon, but was knocked out of the fight so quickly that he only reverted back to Gabumon. After Matt was corrupted by Cherrymon and convinced to fight Tai, Gabumon became MetalGarurumon and fought with WarGreymon. However, the fight was interrupted by a mysterious entity from the DigiWorld's past, who reverted MetalGarurumon back to Tsunomon and WarGreymon back to Koromon. 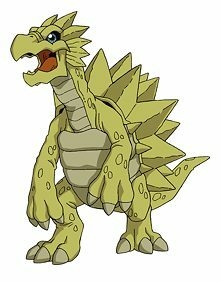 After Matt left the group, Tsunomon Digivolved back to Gabumon off-screen, and then Warp-Digivolved to MetalGarurumon off-screen in time to return to destroy Puppetmon. Twenty-nine years after this, Matt and Soras son has a Tsunomon for a partner. Tsunomon first appears in "And so it begins..." His voice is supplied by Kirk Thornton. Name: From the Japanese word, "tsuno," meaning horn. It may not always be that way! You gotta live life today! I can see whats behind me. I can see whats ahead! Matt sounded as though he had more to sing, but the concert was then interrupted by a DarkTyrannomon and some Bakemon. Turn Around is first heard in Iron Vegiemon. The longer version is heard in A Very Digi Christmas, and is faster than the first version heard. The song is performed by Michael Reisz, Matts voice actor. The name, Turn Around, is not official, but seems pretty darn likely to be the songs title. The first Tuskmon the kids met was one of Myotismon's minions, used as muscle, alongside Snimon. When Myotismon's minions were combing the streets, capturing the populous of Odaiba, Phantomon led Tuskmon and Snimon in an attack on Sora and Matt of the DigiDestined, who were guarding Kari, Tai's little sister, who had been discovered to be the Eighth Child, the predestined eighth member of the DigiDestined. Neither Matt, nor Sora, nor either of their Digimon were a match for Tuskmon and Snimon, but then, Kari offered to give herself up if the fighting stopped. Phantomon agreed, and took her away. Tuskmon popped up with Snimon again a short time later, when they were guarding the Odaiba TV station, where Myotismon had brought Kari. The kids' Ultimate Digimon battled and defeated them, and then went on to battle and destroy Myotismon. When Myotismon began to reconstruct himself as VenomMyotismon, Tuskmon's body was among those that his bats converted to energy to power his new form. Four years later, the Digimon Emperor was seen using a Tuskmon under the control of one of his Dark Rings to pursue a fleeing Elecmon. Later, during the summer, the DigiDestined spied several more Tuskmon under the Emperors control outside of his base, battling with Kuwagamon and DarkTyrannomon. When wild Digimon were appearing all over Earth, several Tuskmon were seen on the India/China border, who were then sent back to the DigiWorld. Some Tuskmon were also present during the final battle with MaloMyotismon. A Tuskmon first appears in "City Under Siege." Name: From the word "tusk." "20,000 DIGI-LEAGUES UNDER THE SEA"
While searching for another new Digi-Egg, the DigiDestined are trapped in an offshore oil platform by MegaSeadramon, with their air supply running out. Cody is forced to overcome his fear of the ocean and escapes in a submersible, calling on Joe for help, but having to lie to do so. As Ikkakumon holds of MegaSeadramon, Whamon smashes into the platform to rescue the kids, who had discovered the new Digi-Egg, the Digi-Egg of Reliability. Cody refuses to take it, feeling unworthy because he had to lie, but Joe explains that he did the right thing. Cody activates the egg, and Armadillomon becomes Submarimon to blast the Dark Spiral off of MegaSeadramon, and then take Cody on a trip to the bottom of the ocean to show him its beauty. Episode Trivia  As anyone can tell you, this episode is named after Jules Vernes classic novel, 20,000 Leagues Under the Sea." The first Tyrannomon the kids encountered was a minion of Etemon, the ruler of the deserts on the Server continent. When the kids were at Piximon's training ground, Matt and Izzy went in search of their Crests. In locating them, they passed through the barrier that shielded Piximon's grounds from detection by Etemon, and the villain picked up their signal and quickly dispatched Tyrannomon to deal with them. Tyrannomon, wrapped in cables from Etemon's Dark Network, attacked at once, shattering the barrier. Piximon defended the kids, but knew he had to rely on Tai and Agumon to save the day, because it would enable them to overcome their fears about Digivolving. Agumon Digivolved into Greymon, and defeated Tyrannomon. Some more Tyrannomon were also seen outside of Etemons pyramid, and several of them were later sucked into the malfunctioning Dark Network and destroyed. When Tai was temporarily returned to the real world, he saw a Tyrannomon flicker in and out of phase with Earth, causing an explosion with a Blaze Blast. Much later, after the defeat of Apocalymon, a Tyrannomon in phase with the real world was seen deleting. Four years later, a whole herd of Tyrannomon were seen under the control of the Digimon Emperor and his Dark Rings. Flamedramon, Halsemon and Digmon battled them as T.K. and Kari found their Digi-Eggs, enabling Patamon and Gatomon to Armour Digivolve to Pegasusmon and Nefertimon. Together, they bound up the Tyrannomon and used their attacks to free from the Emperors control. Much later, when wild Digimon were appearing all over Earth, a Tyrannomon was seen in New York City. Several more Tyrannomon were also sighted on the India/China border - all were soon sent back to the DigiWorld by the DigiDestined. When MaloMyotismon subjected the DigiDestined to illusions of their greatest desires, an illusionary Tyrannomon was seen in Kens. Rather surprisingly, there were NOT any Tyrannomon seen during the final battle with the villain. Name: From the word "Tyrannosaurus," a kind of dinosaur. Tyrannosaurs means tyrant lizard in Greek.